Your roof is an important part of your home, and it’s crucial that it’s in good condition in order to function properly. While any roofing contractor will tell you that it’s important to get your roof inspected annually, the same also goes true for your gutters. Unfortunately, it can be a little harder to tell if you have fundamental gutter problems compared to spots where shingles have fallen off of your roof. So how can you tell if they’re in good condition? If you have the knowledge and know-how, checking the condition of your gutters on your own is perfectly feasible. But what about if you don’t, or if you’d rather not have to pull out the trusty ladder? That’s where Ridgeline Roofing comes in. We’ll gladly inspect your roof and see if it’s a good time for a gutter replacement for your Battle Ground home, or if it’s better to hold off for a later day. Especially in an area filled with trees like Battle Ground, it’s common to see your gutters clogged more than once a year. It can be a pain to clear them out. Is it really worth the time and effort? What do gutters actually do? 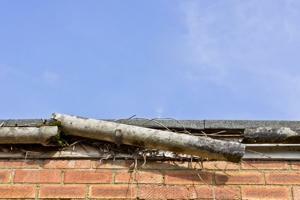 The primary function of gutters is to divert water to a safe area when it falls on your roof. Your roofing always has as slight slope–even if it looks flat–to avoid water from accumulating. Gutters make sure the water that runs off doesn’t fall indiscriminately, but rather to a place where it won’t do any harm. One way that gutters protect your home is that they reduce the chance of flooding, especially in low areas like basements. If you have a basement and don’t have gutters, water could pool down at the surface and soak down into the basement, giving any people or belongings there an unpleasant deluge. Gutters can also stop erosion. Without gutters, the water will fall in the same spots close to your house. Eventually, this land will wear down until there’s an indent where small pools are formed. This can drastically affect your landscaping and appearance of your yard. Do I have to get metal gutters? There are actually many different materials that gutters can be made out of. Aluminum is a popular choice, but vinyl and plastics can also practical options depending on the type of home you have. 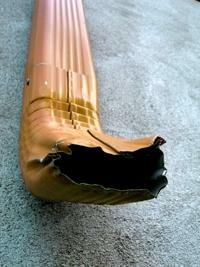 Choose us for gutter replacement and you won’t be disappointed! There’s a reason why we have such high reviews on Google and many other review sites. Customers are pleased by our unmatched service, friendly attitude, prompt work times, and roofing knowledge. We stand behind our work too, so you can feel confident that if something goes wrong, we’ll be there to make it right. Whether you need us for roof repair, a new installation, or gutter replacement in Battle Ground, you’ll get superior service at a great price! Call us today to set up an appointment.